Like other reviews, I too rate this high. Looked everywhere but found nothing to compare with this. I'm really glad I made the purchase. You really need Walter drake to send it to you.....it is not in stores! Very well made and practical. I use this spatula for my home-made apple pie. The pieces are able to be lifted out perfectly with this utensil. Clean-up is a breeze. Product is certainly as advertised. This spatula works on all kinds of cookware/bakeware, is comfortably flexible and tolerates heat well. Useful for cookies, brownies, eggs, and many other situations. I use this spatula on anything that needs picking up from pots pans baking sheets, etc. which are solid shape. Best & most used tool in my kitchen. It Really is My Favorite Spatula!! We used the spatula to cut and serve lasagna and it worked really well. My husband, who is not into kitchen gadgets, even was impressed as he used it to help himself to more lasagna! I can't wait to use it on brownies and cake. This product works great. Gets under brownies and cookies especially well. Bought more to give as Christmas gifts. THIS SPATULA IS PERFECT FOR GETTING BROWNIES OUT OF THE PAN. YOU CAN ALSO USE IS TO CUT THE BROWNIES WITH THE BOTTOM EDGE OF SPATULA. I WOULD DEFINITELY BUY IS AGAIN. LOVE THE BEVELED EDGES WORKS GREAT FOR RUNNING ALONG THE EDGES OF THE PAN TO LOOSEN WHAT EVER YOU HAVE JUST BAKED. MAKES REMOVING BARS AND SERVINGS FROM PANS SUPER EASY. I bought an extra one for my kitchen & 3more for gifts. I've had this in my drawer for quite a while, couldn't find my regular spatula when it came time to flip my eggs. I pulled out this little beauty and magic happened. PERFECT over easy eggs. I was even able to flip them again for better cooking. I'll never use another spatula for flipping eggs. I'm a fan! This spatula has come to replace most all my other spatulas. I use it constantly. I even bought it as a gift to put in a kitchen themed basket. Perfect size for me! No matter what I cook or bake, it works great to serve or to flip. I make a lot of Eggs and it works great! We bought this to lift up fish from the pan to our plates. It works great without breaking the flounder. I love my favorite "SPATULA"
Makes serving brownies and bar desserts easy to get out of pan. This spatula is beveled. If cookies or other desserts are stuck to bottom of pan or dish, this will lift them right off. I bought one for each of my grown kids. They all love it too. Handle is just right for hand , perfect width for pie and cake slices. Lightweight and just stick in dishwasher. I have looked all over my area for this spatula to replace the one I had. Not available where ever I looked. I had to have it when I saw it in your catalog. this spatula is very usful in the kitchen whether baking or frying or serving your baked goods. easy clean in dishwasher or wipe clean. It's the one I reach for. Spatula is a great size - beats using larger spatula! After getting used to the small size I really like this spatula...it slides under and flips my eggs easily..also washes well..I find myself reaching for it all the time. No complaints. Good for just about anything you want to use it for. This spatula is one of my favorites. It is easy to use and handle. Purchased for myself and then purchased as gifts for my family members. Sturdy and practical for the kitchen. Very handy spatula. fits the hands of small helpers as well as adult servers. fits into small places making it easy to travel with to a picnic. This little guy makes it easy to serve. I love it. Worked great taking out my bar cookies. Easy to use. Doesn't scratch the pan. I would buy this again. the end is thin so it slides under eggs great! Love this spatula, it is my favorite! I have looked for this size spatula for years...I use teflon baking pans and these won't scratch. With teenagers, there are always brownies or something that needs to be served and this works perfect. I was so happy to find them, I ordered all they had in stock that day to keep for spares! Really gets the food out without scraping the pans. I already have one and so I got another one at such a great price. This spatula is a kitchen CLASSIC! I bought two of these and then bought three more to give as gifts. I cannot keep these in stock enough to give as gifts. I hope to order more and would recommend it to anyone who is ever looking for a good item for anyone! THIS SPATULA ADDS TO MY MANY SPATULAS. THERE IS NOT JUST ONE SPATULA THAT WILL DO EVERYTHING. I'M ALWAYS LOOKING FOR ANOTHER SPECIAL SPATULA!!!! Once in awhile you come across a product - sometimes a very simple, inexpensive one - that you are so happy to have found. This spatula is definitely "My Favorite" and I will reach for it time and time again!!! I use the spatula for serving brownies and pie - it's just the right size and angle for those smaller requests. This slim design prevents ruining the next slice when my friends ask for "just a small piece". Appropriately named, it is my favorite spatula. Bought mine two years ago,still looks like new, use almost everyday for scrambled eggs or sautees. This one I am giving to a dear friend as a surprise gift. A perfect spatula for brownies! Never had one of these so glad I have one now! Everyone that has used it loves it. I purchased a few of these for stocking stuffers for my married childern and havve to order more for friends who loved them too. Truly the most used spatula! I truly use this spatula more than any other larger spatulas I own. I see why everyone loves this slim spatula that is convenient for everyday use. 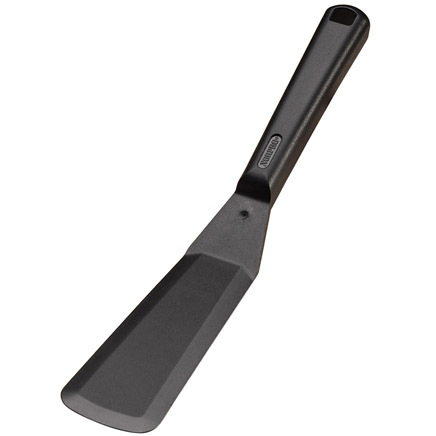 This narrow spatula is perfect for starting the removal of pieces in a baking pan or casserole dish. Slightly flexible, lightweight plastic. I have a feeling I'll be finding more uses for it as time goes on. Just what I needed!! Will use product for small pieces of salads, desserts, casseroles, such as lasagne, etc. I can get every last drop of food out of the pan, especially in narrow spots. I use this spatula for everything to Brownies to mixing I love it. Nice size for kitchen, perfect for flipping small burgers too! Absolutely perfect when serving smaller portions. My husband even loves this. Wish there was a three inch spatula just like this for bigger food itmes. When you get one let me know I will purchase two. I've wanted a spatula like this for a lont time to be able to insert for brownies, cakes, etcd., to loosen bottom. Also, I dind this a great tool to scramble eggs. Just the right size for servings. I bought one for my daughter for Christmas and she liked it so much I bought a second one. Use it mainly for desserts--pies, brownies, etc. This spatula is perfect for the new "green ware" cookware my husband bought for me to use. Best spatula for brownies, etc!! Great utensil for serving brownies or any bar shaped goodies, like blueberry or chocolate chip rectangle cakes! It always goes with me when I take my baked goodies to a pot luck. It's been through the dishwasher several times and still looks new. I may get some of these as stocking stuffers for Christmas!! Great price, too! Love it. Does not scratch my bakeware. I have not used this yet, but its exactly what I had in mind, also small & light weight. I think its going to be perfect for icing all my rolls, cakes, & etc. Good price too. Thank You! I love the flexibility of the server and that it does not scratch my non stick pans. You can never have too many of these. I bought several for me and also gave them to family as gifts. They come in handy when serving desserts during the holidays. This little thing is a must have. May order a few more. Good for use on non stick pans. Needed a more narrow spatula. This fits the bill. Easy to clean. Mainly purchased this for getting my desserts out of thier containers but also was happy to use it on my green ware pots and pans..great for turning eggs, and hashbrowns. Love it..
At first glance I was skeptical. However, this is a terrific kitchen tool. It's flexible and narrow making it perfect for multiple uses. Never again will you have a ugly brownie. They will come out without tearing up the edges. just the right size for small pan! couldn't fit my usual spatulas in my small pan - this one is perfect size! My new favorite helper for the kitchen. Easy to use, convenient, dishwasher safe in top shelf. I reach for it time and again. Sometimes you don't want a large spatula and a smaller one works better. It is sturdy and easy to get into corners of pans. Love it. Best Spatula you'll ever buy! Love this spatula! Bends easily, and makes it easy to get anything out of a dish. Perfect for pies, cakes, brownies...anything! Long enough for big layer cakes too! I need to buy more to give as gifts! A lot of plastic spatulas designed for use with non-stick cookware are too flexible and don't do the job when trying to cut through a casserole or brownies, for example. This one is the perfect compromise - lightweight, yet strong and durable, and safe for non-stick pans. I'm glad I added it to my kitchen tool inventory. For the past 2 years I have searched every kitchen store, shop, on line, even travelled to another province to find a spatula made of something other than metal. Finally have one!!! Now I can flip my pancakes and crepes without ruining my non stick griddle. Thank you for this spatula. Best kitchen item I own. For cakes, cookies, I use them for just about everything. I've only used it once, the day after I received it and it's wonderful. Very flexible and easy to use. I know I'll love using it more that my other ones I have and will probably order another one. I love to bake and when I bake cakes for work I take this along. It is 1 of the best narrow spatulas I have ever had. You can't go wrong with purchasing this spatula. Really works well on oven items, but not sure about cooking on the stove top have not used it yet for that. I used this to spread sauce on a pizza and frost a cake what an amazing kitchen gadget a must have! I washed it and used it right away for some brownies I took to church. They are the perfect size and so convenient. I use this item for removing brownies, etc. from the pan. I had one for years and during a move it disappeared. I really missed it and was very glad to find another one. Works great for non-stick cookware. Also nice and thin for scooping up brownies! I have had mine for over a year and it's still in great shape. moving into new apartment and needed some kitchen equipment - had the usual non-stick pancake turner, but was not sturdy enough for some items. This item works great on anything you need to turn over. For Christmas 2009 I ordered 3 spatulas, one for myself & 2 for each of my daughers-in-law. They are a great non-scratch spatula for bars, desserts and especially for the 3 compartmented brownie pan, which I also ordered 3 of. i use this product for corn bread...cakes, works so nice to hard to get to places..
Sturdy tool; the width of the spatula is the perfect size to cut desserts such as 2" bars. This really is my favorite spatula! I reach for it for almost every job that would use a turner, or saute purpose! We had one, but my husband liked it so well that we ordered two more. It is the only spatula that he will use. This spatula is great. I use it for every day things like eggs and also for things like when I sautee something. I just replaced all of my wooden utensils and this one is multi-purpose. I now have four of them. My husband and I both love this spatula. It is not flimsy, but very solid. It is heat tolerant. we do stocking stuffers for our grown kids and this was the first thing I bought knowing they would like it and use. Can't think of anything bad to say. Highly recommend. Most spatulas bend or won't slid under tender fried eggs and other things. This works wonderfully. It's name says it all, it is my favorite spatula. This is very handy.....keeps from scratching my bakeware and pots and pans. Glad I bought it. I use it to flip eggs easy over much easier than a regular spatula. I have purchased these before because I love mine. I have older granddaughters who received one for Christmas from me. Two were recently married and one is getting married next June. It is such a handy tool. I use it all the time. This is great for brownies, cakes, casseroles. It's narrow and long so it's the perfect size and cleans up easily. I was so surprised at the quality and ease of this product. I use it for anything and everything in my kitchen. I would say it is my favorite multi-use gadget I own. I would say this is a sensible purchase. EASY TO USE IN MALL PANS. Really a Favorite with Me. Sturdy enough to handle my peach pie. Bought this along with 2 plastic knives, to keep my non-stick bakeware from being scratched. It does not scratch my pan when getting things out. Best gadget to get the first serving out of the pan. Bought it because it was suggested - like it! Use it mostly in frying pan. I love this spatula I use it at home I have taken it to outings it is very handy. In fact I have bought a few things from Miles Kimball and I have always been very satisfied with their products. They have neat kitchen gadgets. I use this product quite a bit. It is perfect for brownies, bars, cake, omelets, single fry eggs, etc. Easy to clean and a perfect size. My daughter liked mine so I ordered her one and another one for me. My husband even loves this spatula! It's compact size is incredibly handy and it's sturdy with just enough flexibility to get into tight spaces. We love it! This is a great spatula! It is wonderful for lifting lasagne out of the pan. Also, for serving cake slices from either a pan or lifting the cake off of the serving plate. Love this spatula! It is just perfect! Love this spatula, it is a perfect size to serve pies or cakes! sturdy. Cleans up easily. Great little kitchen helper. This product is rightfully titled... 'My Favorite Spatula'... because it can do so much, and yet it is small. How would I change it? Wouldn't... it's great just like it is! Just like it says, it is My Favorite Spatula! easy to use. I make small batches of fried food and it is perfect for turning and flipping! We had a spatula like this one years ago and liked it very much. Although I already own one of these, just purchased another, because I hated to have it in the dishwasher when I needed it. It's the one I use the most. I bought one a year ago, and have used it so much, I got a second one. It is perfect for anything you need to remove or flip in a pan, including pancakes. I used this spatula when baking cookies for Christmas. I could get two cookies on it at one time and loved using it. I look forward to using it for brownies and desserts. I won't have to worry about it scratching my non-stick bakeware. This spatula is solid enough to cut meatloaf into sections and gives enough to reach under and scoop the pieces out. Everything is great about it.....when I use my wide spatulas for flipping pancakes....they always mess up the one next to it.....this one is PERFECT !!! Also for cutting cakes or pies....applies the same way..so much easier and cleaner. This 74 year old great grandmother found a tool she loves !! Love it. Have purchawsed several and given as gifts. Very handy and useful. Works on non stick and just love it. This spatula made it easier to get brownies out of the pan. Like having a little cooking spatula for tight spaces. It IS my "favorite" spatula! I keep this next to the stove. I don't want to have to LOOK for it because I use it all the time. Trying to flip a patty or a slice or two of bacon? Good luck with a regular size spatula. This narrow spatula can slip in between items and not disturb the neighboring food. Handy for a myriad of uses. The name says it all - MY FAVORITE SPATULA. So glad we found this. From the minute I got this, I washed it, used it and it immediately became my "favorite" spatula!! Seriously! I bake a lot of brownies, bar cookies and sweets that are as much show as taste. Lots of them are very rich so you need to serve smaller pieces. I was SO tired of them getting all torn up when trying to get them out of the pan with a standard sized spatula! This one is perfect. Just the right width and it is very smooth so nothing sticks. I have also used on the stove and haven't had any problem with it not being able to handle the heat. This spatula is great for getting into tight corners for cakes and casseroles. It handles nicely. Even great with pies. I am very glad I purchased this. I keep finding more ways to use it all the time. Love love love it perfect for that hard to get at baking or serving. One of the best products you can buy! 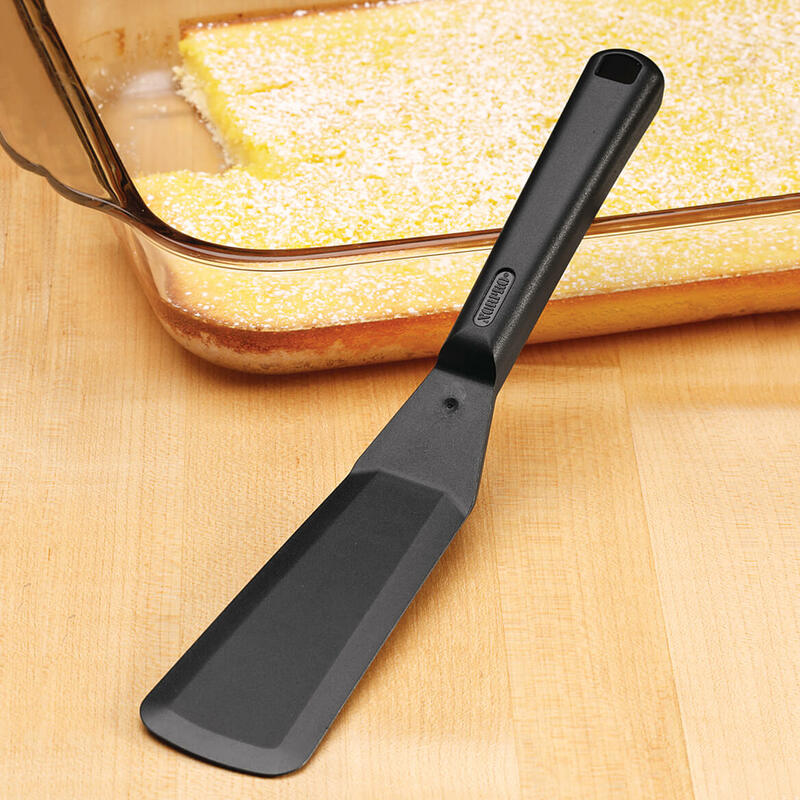 This spatula is a perfect size and it is wonderful for making omelets. I like that this spatula is a sleek design and contours nicely in your hand. I use it for baking croissants,cookies and sometimes for broiler cooking as well. Easy to use. Great for serving pieces of cakes, brownies, etc. Also good for casseroles. I don't bake much, so I don't use it for brownies and such. I haven't had it very long, and I'm using it for things it wasn't advertised for, and I love it. It is very handy when I want to turn things from a dish without disturbing the items around them, because it is so slim. I use it a lot as a gathering helper when I'm chopping onions and such for my salads. It's just a handy little tool for me. Small & flexible. Easy to clean. I have one of these, same shape and size, but in metal and it scratches my non-stick pans. Perfect for serving brownies and cakes, and even used for eggs. Only complaint is that it is a little flimsy. It is very handy and works well, but if it was stronger it would lift item from pan w/o having to use my hand to make sure. Nice size! we have used it several times and it met our expectations. I use it because of coating on my non stick brownie pan, but it's not very thin like a metal spatula I had carefully been using. I bought a few for gifts and myself strictly because it is advertised as thin. I do use it to peek under eggs and grilled sandwiches. It is very good quality. This server is perfect for smaller size servings where a larger, standard-size server won't fit. It is the perfect size for desserts. I love it! great fore most cooking and backing. Love this thin spatula for serving enchliadas! Works good on taking things out of pans so that you don't scratch the bottom of the pan.I use it to cut brownies with, does a good job and lifts out easily. I am buying this spatula again. This product is ideal for using when lifting smaller pieces out of a pan. It will go under the smallest of brownies and not break them up like the larger spatulas. I have even used this one like a spatula to stir my bowl. I have enjoyed using so much that I plan to purchase it again to use as stocking stuffers for the bakers (couple men) in my family. Really handy tool for getting baked goods out of pans. It's narrow enough to get under brownies and other baked goods so you can get the first slice out without making a mess. This product will be used to lift casseroles and desserts from their dishes. I wish it were a little wider but I'm sure I will find many other uses for it. I've taken bread out of a pan, used it to lift lasagna from a pan. It is perfect for those "thin pieces" of baking. Wish I had ordered a few more now, and will do so soon! I need one in the RV unit! When I tried to cut and serve something with a crisp crust, both cutter and server bent so easily that they were difficult to use. They may be OK on softer food. I like the wideth of this spatula. It's a good size for cakes and brownies. Also it can be used on non-stick pans. I bought this because I needed a spatula that would be able to lift slices of anything like any other spatula but be the right size for what I needed. It turned out to be flimsy and gave under the weight of a slice of pumpkin pie. I was sadly disappointed. To flimsy,hard to lift out anything. Thin and lightweight - yes, but flimsy. I bought this specifically to get bars (like brownies) and casserole servings out of the baking pan. The shape of it is perfect - it is long enough to lift at least two bars out of the pan without breaking them. However, it does feel somewhat flimsy and not especially heavy-duty, so I'm not sure how long it will be useful. Nice product. It is a little narrower than I was looking for but I know I will get a lot of use out of it. Loved it at first, but then I noticed edges were flaking off, almost as if it was melting. Had to throw it away, very disappointed. I sterilzed this product in my dishwasher before using. It still smelled strongly of chemicals. I'm sure it's what the product is made of. I will be returning it to Miles Kimball. Maybe mine was a dud? I'm amazed by all the glowing reviews on this item. I bought one a couple years ago and even though I tried every method I know, the adhesive from the label (which is on the business end of the spatula) would not come off. I should have returned it, but didn't bother. It sat unused in my kitchen drawer, annoying me, until I finally threw it away! This for my personal use. Seems to be the right size for removing brownie fudge from pans. Needed a non scratching spatula for my air fryer. I love this spatula. It is especially helpful when taking brownies out of a pan. Getting the FIRST piece of cake, brownie, etc. is always a problem--hope this solves the problem. Looks like a great spatula to get desserts out. Love this spatula and had to have more!! I have four of them already and I love them. This has many uses in the kitchen! size is great for fish and getting a lasagna slice out of pan..
Had one before and loved it. I love mine and use them often but wanted stocking stuffers for my twin sister and son for Christmas. I bought several different items offered here and have been very pleased with everything I bought. Thank you. This is a great spatula. I have had mine from WD for years. I am ordering this one for my married granddaughter. It is truly my "favorite spatula". looks very handy. We usually use a knife or fork. This will be nicer. To take with me to the office when I bring in baking so I don't lose my more expensive spatulas. I have been looking forever for a spatula this sixe!! It will be prefect. I have one of these and I love them for serving desserts. Can't use them for hot items, but great for cooler items. Is this item boa free? BEST ANSWER: Thank you for your question. The spatula is BPA free. We hope this information will be of help to you.